The common area within a cluster/open space development is often owned and managed through a homeowners association. 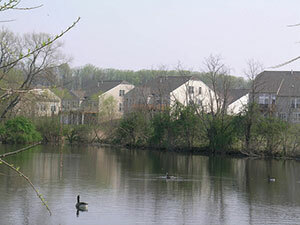 Homeowner association open space, or HOA open space, has become a typical part of subdivisions and land developments in Chester County. These common areas involve a management plan, often limited to mowed fields, even on wetlands, steep slopes and stream banks. In many cases, HOA open space could be better-managed as natural areas or as internal loop trails, enhancing the environment while reducing maintenance and energy costs. Such properties need to be managed in perpetuity. HOA open space management concerns include maintaining native vegetation and biodiversity, providing security and liability coverage, trail access and maintenance, and securing maintenance funding and staff. The key to managing HOA open spaces is developing guidelines for the HOA to follow. These guidelines can call for retention basins to be properly managed rather than just mowed, or for riparian buffers to be maintained. The guidelines should also address access to HOA open spaces where appropriate so that the public can "connect" with nearby natural resources. In most settings, trails are the preferred mechanism for providing this access. Access must be balanced to avoid overuse. Furthermore, there should be guidance regarding security and liability coverage, trail access, and maintenance. Energy Conservation: Energy conservation is achieved by limiting unnecessary site disturbance and by reducing the need to remediate damage to sensitive environmental areas. Improves Property Values: Proper HOA open space maintenance improves property values by promoting trees and nearby natural areas for residents. Improves Water Quality: HOA maintenance improves water quality, reduces stormwater runoff, and provides animal habitat. Promotes Recreational Opportunities: The proper maintenance of HOA open space areas can create inviting opportunities for nearby recreational activities. Maintenance Required: HOA open space areas require maintenance and management plans in perpetuity. Increased Administration: The maintenance of HOA open space areas may require increased application review, as well as increased inspections and enforcement during and after construction. Increased Education: Emphasis must be given to the role that homeowners play in minimizing environmental damage to HOA areas. Continuing education for residents regarding homeowner landscape practices and pollutant prevention techniques is required. Financial Commitments: The HOA that will be responsible for the maintenance of the open space areas in perpetuity must be organized and established at the onset of the project, and the HOA must have the long-term financial ability and commitment for fulfilling that responsibility. Guidelines can be developed by the HOA, or natural resource protection measures can be included in municipal ordinances and regulations, and then applied to HOA property. Municipalities can also adopt provisions requiring that HOA maintenance guidelines be created for all new developments which include HOA open space. Trails within HOA open space can be designated in a municipal comprehensive plan or in a official map. Municipalities should also require that the HOA is adequately capitalized to ensure that the open space areas can be properly maintained in perpetuity, and that future repairs that require large capital outlays can be funded. Municipal approval of subdivisions and land developments should include provisions for contacting responsible persons who serve on the HOA board to ensure that emergency repairs can be completed quickly. Cluster Subdivision Design Guide, Chester County Planning Commission, 2003.